The NKBA Kitchen & Bathroom Planning Guidelines is a collection of planning suggestions to help effective planning of kitchens and bathrooms. These guidelines are excerpted from the National Kitchen & Bath Association Professional Resource Library Kitchen Planning and Bath Planning volumes. Guideline: The clear opening of a doorway should be at least 32″ wide. This requires a minimum 34″ or 2′-10″ door. Guideline: No entry door should interfere with the safe operation of appliances, nor should appliance doors interfere with one another. In addition, the door area should include clear floor space for maneuvering which varies according to the type of door and direction of approach. Guideline: In a kitchen with three work centers the sum of the three traveled distances should total no more than 26′ with no single leg of the triangle measuring less than 4 feet nor more than 9 feet. A major appliance and its surrounding landing/work area form a work center. The distances between the three primary work centers (cooking surface, clean-up/prep primary sink, and refrigeration storage) form a work triangle. 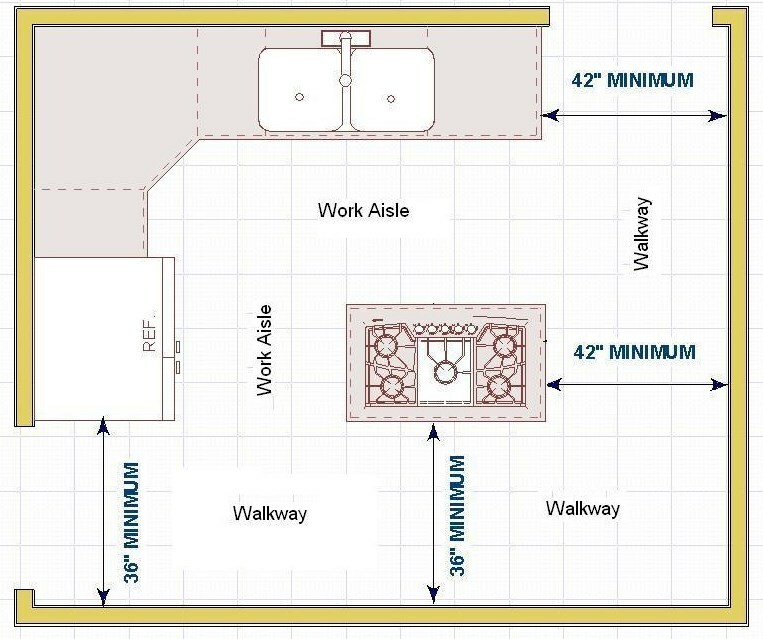 When the kitchen plan includes more than three primary appliance/work centers, each additional travel distance to another appliance/work center should measure no less than 4′ nor more than 9′. Each leg is measured from the center-front of the appliance/sink. No work triangle leg may intersect an island/peninsula or other obstacle by more than 12″. Guideline: No major traffic patterns should cross through the basic work triangle. Guideline: The width of a work aisle should be at least 42” for one cook and at least 48” for multiple cooks. Measure between the counter frontage, tall cabinets and/or appliances. Guideline: The width of a walkway should be at least 36”. If two walkways are perpendicular to each other, one walkway should be at least 42” wide. There is a great deal of confusion over the distinction between a walkway and a work aisle. A work aisle is where a person stands while working in the kitchen. A walkway is the passageway through the kitchen. Guideline: In a seating area where no traffic passes behind a seated diner, allow 32” of clearance from the counter/table edge to any wall or other obstruction behind the seating area. In a seating area where no traffic passes behind a seated diner, allow 36” of clearance from the counter/table edge to any wall or other obstruction behind the seating area, any area with more than one seat requires a minimum of 36″. 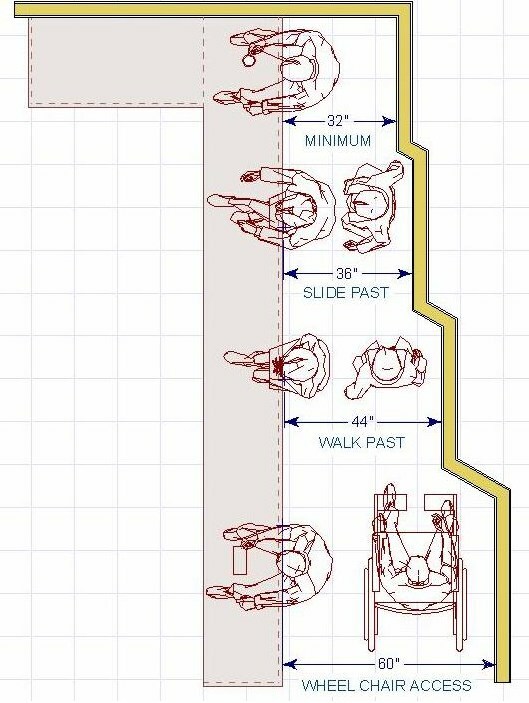 If traffic passes behind the seated diner, allow at least 44” to walk past. For 30″ high tables/counters, a minimum 18″ deep clear knee space for each seated diner. For 36″ high counters, a minimum 15″ deep clear knee space for each seated diner. For 42″ high counters, a minimum 12″deep clear knee space for each seated diner. Guideline: If a kitchen has only one sink, locate it adjacent to or across from the cooking surface and refrigerator. Guideline: Include at least a 24” wide landing area to one side of the sink and at least an 18” wide landing area on the other side. Note A: If all of the countertop at the sink is not the same height, then plan a 24” landing area on one side of the sink and 3” of countertop frontage on the other side, both at the same height as the sink. Note B: The 24” of recommended landing area can be met by 3” of countertop frontage from the edge of the sink to the inside corner of the countertop if more than 21” of countertop frontage is available on the return. Guideline: Include a section of continuous countertop at least 30” wide x 24” deep immediately next to a sink for a primary preparation/work area. Guideline: Locate nearest edge of the primary dishwasher within 36” of the nearest edge of a cleanup/prep sink. Note A: Provide at least 21”* of standing space between the edge of the dishwasher and countertop frontage, appliances and/or cabinets, which are placed at a right angle to the dishwasher. Note B: *In a diagonal installation, the 21” is measured from the center of the sink to the edge of the dishwasher door in an open position. Guideline: Include at least two waste receptacles. Locate one near each of the cleanup/prep sink(s) and a second for recycling either in the kitchen or nearby. Guideline: At least 3” of countertop frontage should be provided on one side of the auxiliary sink, and 18” of countertop frontage on the other side, both at the same height as the sink. Guideline: Include a minimum of 12” of landing area on one side of a cooking surface and 15” on the other side. Note A: The 12” and 15” landing areas must be at the same height as the cooking surface. Note B: For safety reasons, in an island or peninsula situation, the countertop should also extend a minimum of 9” behind the cooking surface if the counter height is the same as the surface-cooking appliance. Guideline: Allow 24” of clearance between the cooking surface and a protected noncombustible surface above it. Guideline: Provide a correctly sized, ducted ventilation system for all cooking surface appliances. The recommended minimum is 150 cubic feet of air per minute (cfm). Guideline: Locate the microwave oven after considering the user’s height and abilities. The ideal location for the bottom of the microwave is 3” below the principal user’s shoulder but no more than 54” above the floor. If the microwave oven is placed below the countertop the oven bottom must be at least 15” off the finished floor. Guideline: Provide at least a 15” landing area above, below, or adjacent to the handle side of a microwave oven. Include at least a 15” landing area next to or above the oven. At least a 15” landing area that is not more than 48” across from the oven is acceptable if the appliance does not open into a walkway. Guideline: If two landing areas are adjacent to one another, determine a new minimum for the two adjoining spaces by taking the larger of the two landing area requirements and adding 12″. Guideline: A total of 158” of countertop frontage, 24” deep, with at least 15” of clearance above, is needed to accommodate all uses, including landing area, preparation/work area, and storage. Guideline: Specify clipped or round corners rather than pointed corners on all countertops. Shelf and drawer frontage is determined by multiplying the cabinet size by the number and depth of the shelves or drawers in the cabinet, using the following formula: Cabinet width in inches x number of shelf/drawers x cabinet depth in feet (or fraction thereof) = Shelf/Drawer Frontage. The recommended distribution for the shelf/drawer frontage in inches is shown in the table above. The totals for wall, base, drawer and pantry shelf/ drawer frontage can be adjusted upward or downward as long as the recommended total stays the same. at least 560” for a large kitchen (more than 350 sq. ft.). Guideline: GFCI (Ground-fault circuit-interrupter) protection is required on all receptacles servicing countertop surfaces within the kitchen. (IRC E 3802.6). Refer to IRC E 3801.4.1 through E 3801.4.5 for receptacle placement and locations. Guideline: In addition to general lighting required by code, every work surface should be well illuminated by appropriate task lighting.